I had been hoping to play Dear Esther for many months now, since I first saw the trailer on the Steam store. After I watched it, I began to wonder why I wanted to play it. There didn’t seem to be any gameplay to speak of, it simply looked pretty and while I can enjoy looking at art, I never buy a game just because it looks good. When a friend let me know it was in a sale on Steam, I took the opportunity and purchased it, and I haven’t regretted it. 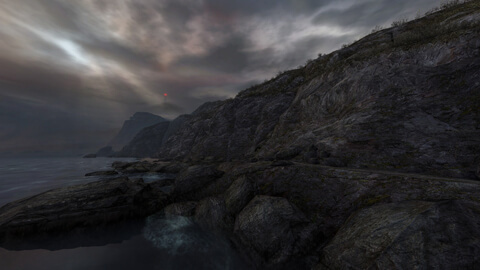 In Dear Esther, you play as an unidentified character alone on a island. The only action you can take is to walk around. There is no visual interface to speak of, and no indication of where you should go or what you should do. If you enter a building your torch (flashlight) comes on automatically, and it turns off when you leave. As you follow the paths and curves of the landscape, a narrator (who I assume is my character), began speaking. These monologues occur regularly as you explore and find new areas, but they do not necessarily follow one another. After a while you realise the monologues are played semi-randomly, talking about various characters from the narrator’s life and a book he has read. It is a very ominous game to play through. The location gives the player a sense of freedom, while they are really heading down a pretty linear path with an oddly non-linear story. It is hard to classify Dear Esther as a game. In some ways, it’s more like a travel guide you might take if you were hiking. The writing is a clever mix of a probably unreliable narrator talking about his life, the people in it and another unreliable narrator of a book he has read about the island. What I like about the game is that it builds a story through the player’s interpretation. It is the player who links the monologues together into a cohesive plot which becomes the story of the narrator and, through him, the game. And since the monologues might change on each play thorugh, every time you play the game you can walk away with a different story. And now for something completely different. Or is it? Unlike the indie-produced Dear Esther above, the Mass Effect franchise is a big budget blockbuster game made by Bioware, the arguable kings of role-play video games. Epic in scope and scale, Mass Effect and its sequels have become shining examples of the space opera/third person shooter/role play game genres with rave reviews and criticism in almost equal measure. I got into Mass Effect originally on the Xbox 360 and I absolutely hated it. I played several hours and just got frustrated. I then (stupidly as I thought then) bought it in a Steam sale for pennies and fell in love with it on PC. For those unaware of the games, you play as Commander Sheperd, a naval man or woman (you can choose) a couple of centuries in the future, assigned to a very cool ship called the Normandy. There’s a galactic threat coming, and it is your job to go around the galaxy, pick up some alien help and kill the Big Bad. So far, nothing unusual. But this is Bioware, and this was their big experiment. The dialogue system is a very special thing to note about the franchise. You are given speech options which are only of a similar tone to what the character actually says. The dialogue options can lead you to investigate an issue or character further, or you can speed through them and get back to some action. The most interesting aspect is the player character’s attitude. Some of your responses are rude, some are supportive and others are neutral. Your conversation choices affect your morality scale, which alters the things you can say in later conversations and how you treat the non-playable characters in much the same way as the older Star Wars: Knights of the Old Republic games, if you’ve ever played them. Using the dialogue system, you can begin a relationship with one of the characters which can cause issues with other characters. Also, at certain points during the story, some of your characters can die. The interesting and important thing here is that the player has a choice. Using the (fantastic) dialogue system, you can prevent or cause some of your crew to die. The idea is that whatever happens, you keep playing the game to completion. Each time you play through the story, it is your story, personal to you and your character. This moves us on to my absolute favourite thing about the series. Once you complete the story in the original game, you can import your character into Mass Effect 2. This allows you to continue with your character and see the knock-on effects of your actions in Mass Effect. If a character died in the first game, they are still dead in the second and your character might have to deal with that. You might continue your previous relationship, you might start another. The same thing happens taking your character from Mass Effect 2 to Mass Effect 3. Each game forces you to confront who you saved, the people affected by who died and how you treated people in the universe. In this way, the Mass Effect trilogy is truly one story divided among three games. If I reach the end of 3 and one of my original crew dies, I think I’m actually going to be upset by it. It was hard enough losing a crew member at the end of ME 2. There grows a true emotional connection between the player and the character they have created. My point in talking about these two stories is that they are both personal to the player in very different ways. Dear Esther doesn’t give you obvious choices to decide from, it simply gives you fragments of a story for the player to put together as they will. 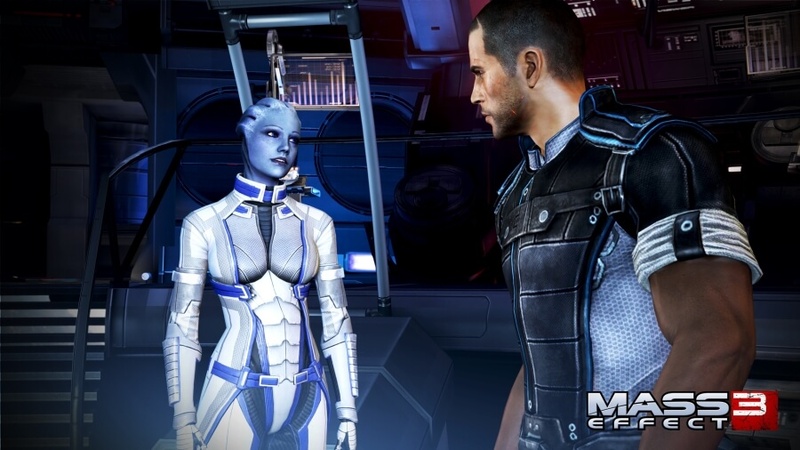 Mass Effect tailors the story to how you play. Each method is different, but both draw the player into the game world and affect their interpretation of the story in much the same way. I would like to think Mass Effect has given us a way of treating sequels as more than just a way to make more money, and Dear Esther is a prominent example of leaving the player to interpret the story away from the game itself.